Happy Saturday! Who's still around and hasn't gone anywhere already for the Thanksgiving holiday? We're staying here. Most of my family is local, so we don't really have to travel far for our Thanksgiving get togethers. This year, everyone will head to my sister Nancy's house to eat, hang out, play Guitar Hero and discuss plans for Christmas. So happy she's only about 10 minutes away from us. Her fiance cooks a mean turkey and everyone pitches in and brings all the fixins' to go with it. What should I bring? Yes, Lauren and Jen, I'll be taking it easy on the feasting (I'm trying to slowly get back on a healthier eating plan--good luck right at the holidays, right?). LOL! Anyway, since today is Saturday, Jen has brought us another lovely Sketch for You To Try and I'm sure "Team Jen" has some wonderful samples to share as well: Shannan, Carole, Amy R. and Amy S.
My snowman card today is quite sparkly. I used 3 different stickles colors on it--that's a first! 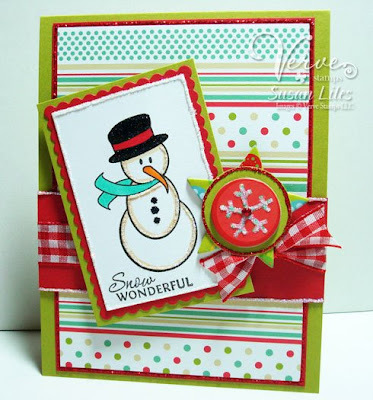 The stamp of the day is the little snowman from Verve's Snow Wonderful set and the little star/circle embellishment is from a chipboard sticker pack I picked up at Big Lots over the summer. I love that store because you just never know what you will find! Kind of like going to the Goodwill store or garage sales! So fun! Hey, that may be where I'll be shopping for Christmas gifts, so don't knock it! Ok, gotta run and get ready for a "Hollywood/Movie/Birthday Party/Sleepover" for Lindsie tonight, complete with a red carpet entrance! I hope you get to play along with us--such an easy sketch and very doable for a quick card! Don't forget to use keyword SFYTT when uploading to SCS so we can find all your creations in one happy place! AND don't forget about the Project Parade going on over at the Verve Blog...there's a prize involved! 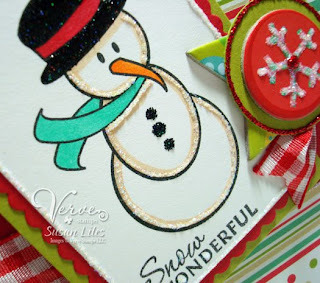 Susie Q-Tip: Line the edges of your card's layers with stickles for an extra sparkly effect. Super cute card! That snowman is a cutie! Sweet, fun, and fabulous, Sus! And you take the best photos, too. I'm paying a lot of attention to that these days because I'm having a hard time in my current locale despite a ton of natural light... Help! What's your secret? Your faithful readers wants to know! Love the big red gingham and all the sparkle! Your snowflake/star bellie is darling as well! Have a Happy Turkey Day, sounds like you're all set to go! Susan this is darling! I love the fun "out of the box" colors you chose! So fun! This is awesome Susan....LOVE it!! I love it! Your snowman is adorable and the ribbon and the paper... its great! Wow Susan! This is soooo awesome with the bright colors and all the sparkle! I love it! !